The genus Allium contains approximately 850 species, and it is the "type" for the Subfamily Allioideae, now once again part of Amaryllidaceae. The genus is perhaps best known from the handful of species that make up the edible food crops we're all familiar with, e.g. onions (Allium cepa), leeks (Allium ampeloprasum), garlic (Allium sativum), scallion (Allium fistulosum relative), and chives (Allium schoenoprasum); but many more species are known for their ornamental value and are thus dubbed the "ornamental onions". Alliums are hardy perennials, having true bulbs, or less-developed vestigial bulbs attached to rhizomes, the latter known as rhizomatous onions. Many species require a winter dormancy and chill whereas other species such as those occurring in a mediterranean climate require a dry summer dormancy. 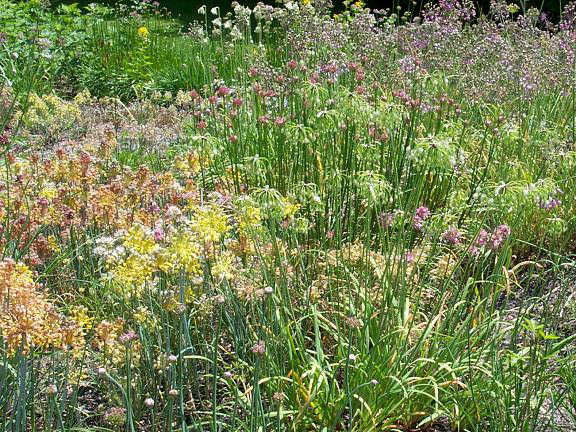 The center of Allium diversity is in the Mediterranean/Middle East region, eastern Asia and North America. In North America, the center of diversity lies in western Texas and the California Floristic Province. There are about a hundred species and varieties that occur in North America. 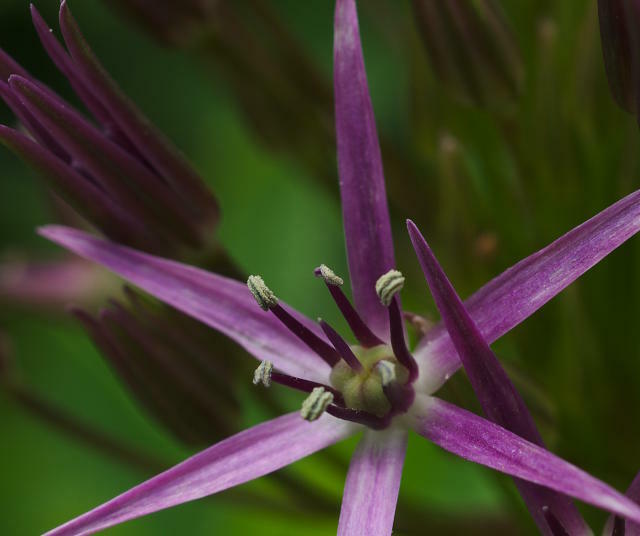 A 2013 paper (a pdf file of 244 pages) entitled A Taxonomic Review of Allium subg. Melanocrommyum in Iran by Reinhard M. Fritsch and Mehrdad Abbasi presents detailed descriptions of 76 species and subspecies (10 newly described in this paper) plus 7 taxa too incompletely known to judge about their taxonomic state. Allium was the subject of the Pacific Bulb Society's topic of the week in March 2003. Click on Introduction to read Mark McDonough's introduction and on Follow-ups from Mark to read some of his other contributions that week. One useful book for this genus is Davies, 1992 described in References. Some species become formidable weeds. Some of these species produce bulbils instead of flowers, or may produce numerous stem bulbils below ground; others may just naturalize in disturbed areas in climates similar to their own. Alliums that tend to have these behaviors include Allium canadense, Allium paradoxum, Allium roseum, Allium triquetrum and Allium vineale. Cut off flower heads before bulbils fall away. Careful digging and removal of all bulbs and bulbils is the primary control method. Landfill or burn this plant material, do not compost it. Allium "Garden View" 1 - In July the allium garden is at its peak with numerous flowering species. 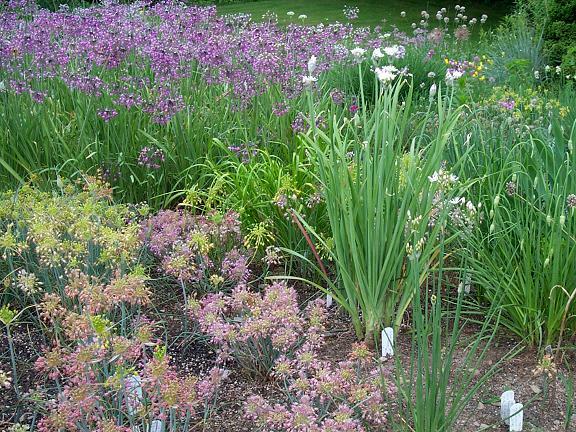 In this view there's a drift of rosy-purple Allium cernuum in the background, an upright clump of A. plummerae with white flowers just starting to open, and in the foreground on the left, various forms of Allium flavum ssp. tauricum in pink and tan colors, with the drooping buds of Allium stellatum on the right (which are weeks away from bloom in late August). Allium "Garden View 2" - In mid July, among the searing heat in the upper 90's Fahrenheit (36 Celsius), the allium garden is a simmering landscape of pastel flower sprays and color bobs wavering in the hot breeze. The next photo shows bulb profiles - a view of four uprooted allium species with the soil washed off. 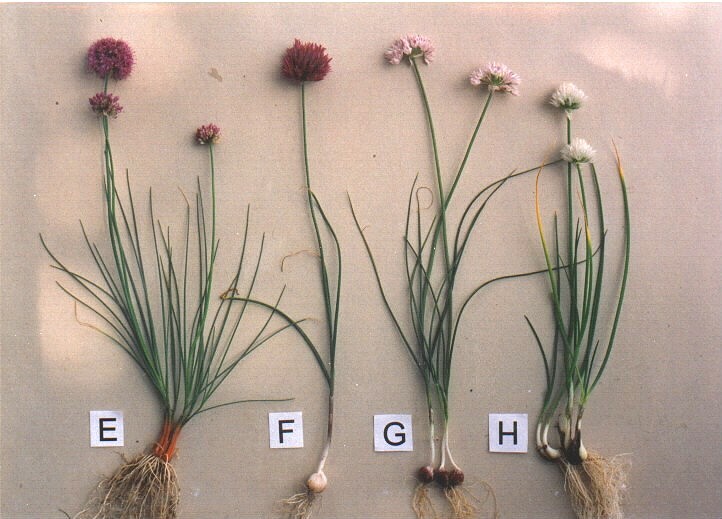 From left to right the species are: A. przewalskianum (an Asian species; notice the orange bulb coats), Allium heldreichii (a hardy species from Greece), Allium amplectens (pink form of this western American onion), and Allium schoenoprasum 'Snowcap' on the right, a dwarf white-flowered chive. Photos by Mark McDonough. The final photo by David Pilling shows the characteristic flower of Alliums, with six stamens, six petals and a single style in the middle of a three celled ovary. Information on named species can be found on the wiki pages below or by selecting the species in the table. Species of Allium can be found in this table. To see hybrids and selections see the table at the bottom of the page.